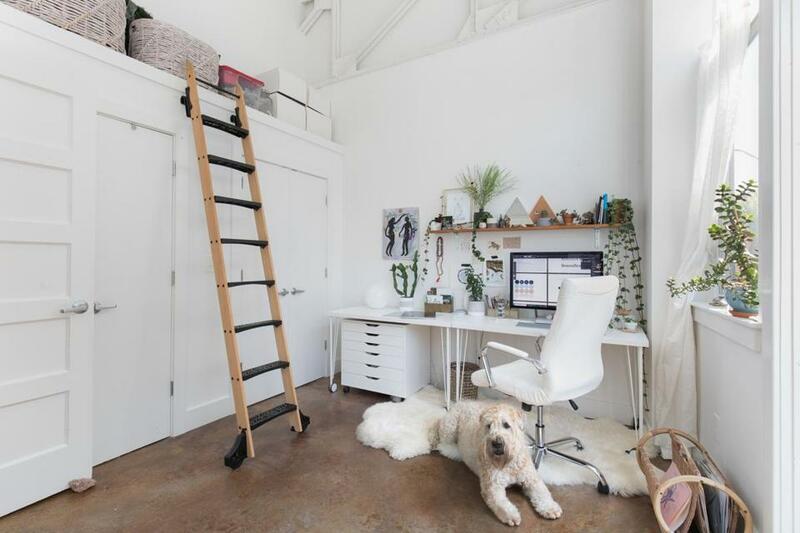 2 An industrial-style ladder extends to the overhead storage space, which holds baskets of vases, extra serving pieces, and Christmas decorations. 3 The painting Cosmic Light by Los Angeles-based painter Meagan Boyd was an Instagram discovery. 5 Maniatis built the shelf using no-frills L brackets as supports to match the loft’s raw aesthetic. “I’m in the wood aisle at Home Depot quite a bit,” she says. 6 A sheer curtain from West Elm blocks enough light to cut glare but still keep the room bright. The second jade plant is from local floral designer and client Orly Khon. “It’s so happy in that spot,” Maniatis says.